Shopping for Sleeping Beauty Statues? It's wedding bells for Princess Aurora! The stunning statue stands 8 1/4-inches tall. From Sleeping Beauty and Enesco's Disney Couture de Force collection. Briar Rose joins the bridal collection from Disney Couture de Force! Princess Aurora is resplendent in her antique satin gown adorned with wild roses, accents of baby blue and pink, a bejeweled crown suitable for royalty, and a bouquet of pink roses. 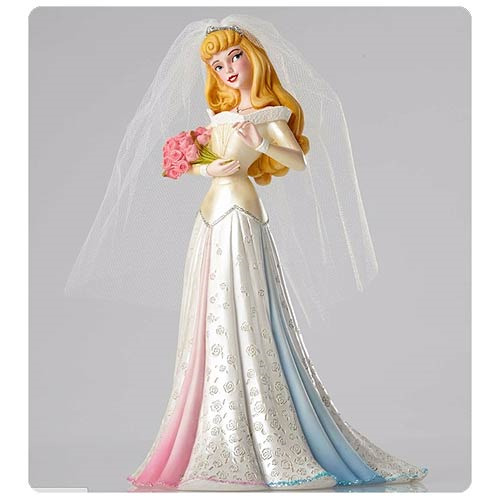 The Disney Showcase Sleeping Beauty Bride Aurora Couture de Force Statue is made of stone resin and measures approximately 8 1/4-inches tall x 5 1/2-inches long x 4 1/2-inches wide. Ages 13 and up.